Steamroller automatically converts Arma 2 road networks to shapefiles for use with Arma 3’s new road technology. It was originally written in 2014, and has since been used by the authors of many popular Arma 2 maps to update their road networks for Arma 3 map releases. Reading the text job (.job) file specified on the command line. The download for Steamroller includes an example job file that will work for most of Bohemia Interactive’s Arma 2 (CA) maps. Note that in configurations, backspaces must be escaped. If the unbinarized .wrp file is not available, any binarized .wrp can be converted to 8WVR using Mikero’s tools. The filter is designed to increase the speed of road generation. Including directories that do not contain roads is harmless, but will increase the time required to generate shapefiles. Again, backslashes must be quoted. This feature is only needed when copy of the original road model is not available, and where a road model with identical memory points is available. 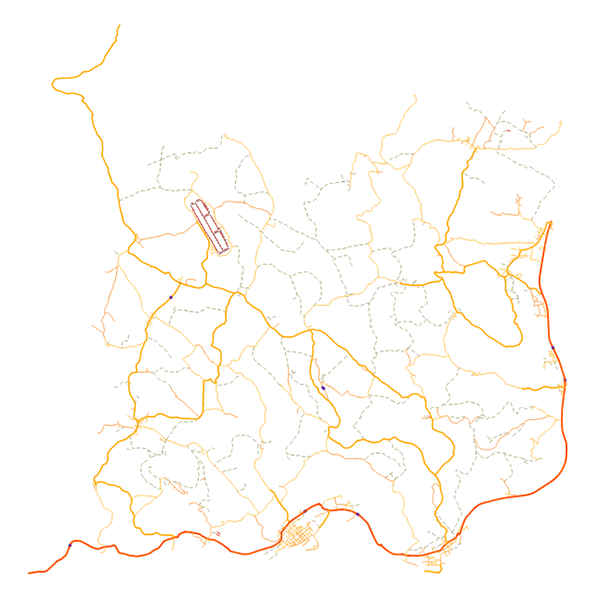 Most custom roads were designed to be exactly the same dimensions as the Arma 2 (CA) roads, and therefore most maps with custom road pieces can be converted by adding the Arma 2 samples to the search path and adding aliases to the samples. "LD", "LH", "PH" and "PD". These models are ignored for the purpose of generating the shapefile. The models are placed into layers (or deleted) using regular expression rules. There are three different types of rules, all of which use regular expressions to match the .pbo paths of the .p3d model files. Any segments that match a layer rule are placed into the layer in a shapefile. Once road models are loaded and assigned to layers, the memory points of each road segment instance are placed into a spatial index and then "snapped" to adjacent road segments. The memory points don’t need to be exactly aligned; a threshold (the snap_threshold) is used to determine how close points must be. Road segments that snap are joined into continuous shapefile roads based on layer assignments. 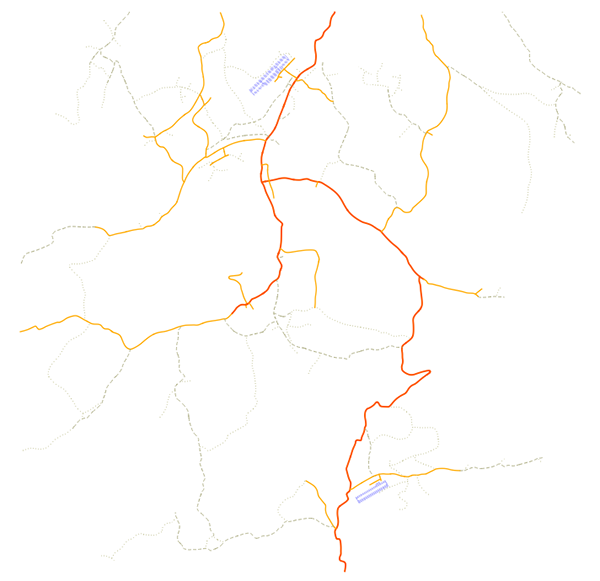 Any glue segments are assigned to the roads that connect to them (for example, in a "T" junction, part of the junction is assigned to the through road, and the other part is assigned to the branching road. Any coincident points from road centrelines are removed. The threshold for coincident points is coincident_point_threshold, which is the minimum distance between points in meters. The simplification guarantees that for any simplified line segment in the output road, the points of the original road fall no more than simplification_threshold meters from the simplified road centerline. Having the simplification threshold too small will cause many small segments to be generated which will result in visual artefacts in game. Roads are smoothed by the game using curve fitting, so only a few segments even on highly curved roads are required. A .shp file, a shapefile. A .dbf file, an attribute file. A .log file, a text log of the diagnostic output. After conversion, the shapefiles can be loaded into Terrain Builder or a GIS package and viewed and edited. Note that any shapefiles or other data derived from materials released under Bohemia Interactive’s Public Data licences would also almost certainly be subject to the same licence conditions.